Shortly after the development of the Scout Experimental 5, the improved S.E.5a was introduced. When it entered the war in 1917, it was superior to all its German opponents. 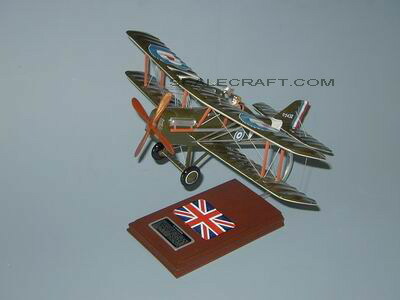 Many pilots preferred it to the Sopwith Camel. It was easier to fly, it performed better at high altitude and its inline engine produced less noise. It was also faster than the Camel, allowing a pilot to break off combat at will. Disdained by Albert Ball, in the hands of airmen like William Bishop and Edward Mannock, the S.E.5a developed a reputation as a formidable fighter. With 54 victories, South African Anthony Beauchamp Proctor downed more enemy aircraft with this plane than any other ace. 207 pilots died in combat and 79 pilots died from non-combat related causes while flying the S.E.5 and S.E.5a during World War I.
Mahogany Wood. Scale: 1/20. Wingspan 16 inches, Length 12 1/2 inches.